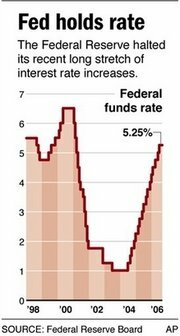 For the first time in two years, the Federal Reserve took a break by not raising interest rates. From what I've read, investors aren't sure whether this will be a long pause or a short one. For now, the discount rate (a key benchmark for all interest rates) will stay at 5.25%, a welcome relief for many borrowers. What does this mean for housing? Mortgage rates nationwide have recently begun trending lower so the Fed decision today could help ease the landing for housing in many parts of the country. Many borrowers who took out adjustable rate mortgages (ARMs) might not be pinched quite so badly, though no doubt they'll notice the difference when low initial rates reset to benchmark levels. As a whole, I think the news is good for housing. Areas facing high inventory, slowing sales, and a wave of foreclosures might see some relief if mortgage rates continue to decrease. Meanwhile, the battle between slowing growth and rising inflation will determine what the Fed does next. The Federal Open Market Committee decided today to keep its target for the federal funds rate at 5-1/4 percent. Economic growth has moderated from its quite strong pace earlier this year, partly reflecting a gradual cooling of the housing market and the lagged effects of increases in interest rates and energy prices. Readings on core inflation have been elevated in recent months, and the high levels of resource utilization and of the prices of energy and other commodities have the potential to sustain inflation pressures. However, inflation pressures seem likely to moderate over time, reflecting contained inflation expectations and the cumulative effects of monetary policy actions and other factors restraining aggregate demand. Voting for the FOMC monetary policy action were: Ben S. Bernanke, Chairman; Timothy F. Geithner, Vice Chairman; Susan S. Bies; Jack Guynn; Donald L. Kohn; Randall S. Kroszner; Sandra Pianalto; Kevin M. Warsh; and Janet L. Yellen. Voting against was Jeffrey M. Lacker, who preferred an increase of 25 basis points in the federal funds rate target at this meeting.